Take the stress out of finding new business and let it find you with our Online Data Mining Program, a true marketing advantage. Scratch to win cards and Peel to win cards can now be used to direct new potential customers to your website. Our Online Data Mining Program maximizes your ROI by collecting valuable contact information online and then redirecting to your web page to immediately boost website traffic, ultimately guiding new business right into your hands with ease. 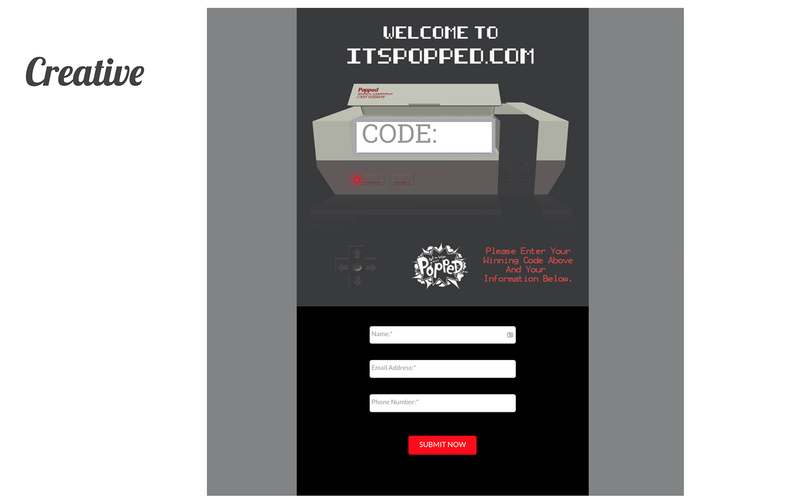 We create a custom scratch or peel to win card and landing page based off your website and brand colors. You distribute the cards amongst your prospective customers (or even current customers if you’re looking to obtain more of their information). They scratch or peel to reveal a website URL and a unique code that must be entered online with additional information. 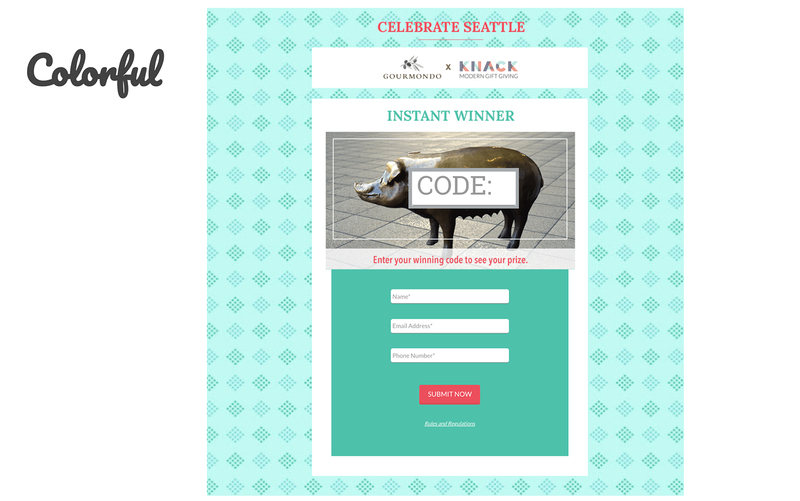 Once submitted, the prize is revealed to your customer (one of the prizes could also be Please Try Again), and your customer’s information is securely stored on our cloud server so you never have to worry about a data breach, leak, or hack. You can then download all of the submitted customer data as a CSV via a Reporting tool at your leisure, OR have reports sent to you weekly. 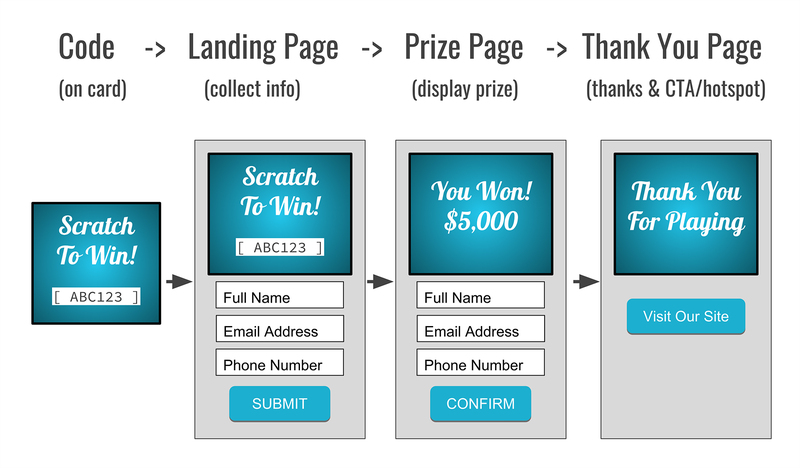 Your customer goes to the custom-made landing page for your campaign. They enter their information and see what Prize they’ve won, confirming the information they entered was correct. 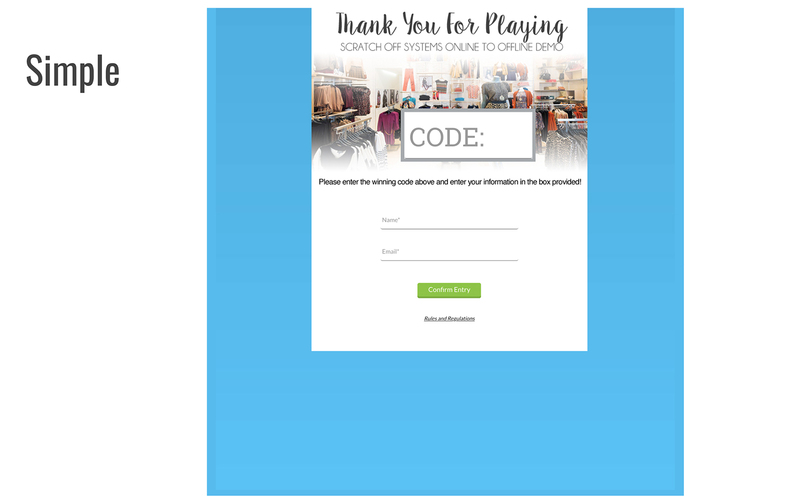 Finally they are taken to a Thank You page with an optional Call-to-Action (CTA) that can link back to your site to help further conversions and engagement with your brand. We make sure your campaign converts as highly as possible so your money and time isn’t wasted. That’s why we’ve put together a few examples of past projects that have converted very highly (20+%). Plus, this shows off what some live programs actually look like so you can get a feel for what your company’s campaign might look like as well. Our engineers have put together a tool that allows you to quickly and efficiently download all of your customers’ submissions. With the click of a button you’ll get instant access to all of the information your customers have entered. Our reporting tool is locked securely behind a login wall to ensure that you and only you get access to your customers’ information. You can also have multiple people on your team be given access with their own login information so that everyone can see the progress. Answer: You have access to the reporting tool from the day we create your campaign, until 30 days after the end date. For example, if your campaign runs January 1st to February 28th, you’ll have access until March 30th to download the data. The data is NOT lost or removed, so we can always send you the reports afterward if need be. Are the codes guaranteed to be unique for each customer? Yes! We double-check and cross-check our database upon generation to ensure that there are ZERO duplicates. We also do other stuff like: make sure there are no offensive or derogatory words in a code. We don’t want you (or us) looking bad, so we take care of that too. And in case you add codes after a campaign has already started, we still do the same checks to ensure that the codes are all 100% unique. Can any codes be claimed before the Start Date or after the End Date? We have checks in place upon submission to ensure that a code can only be claimed within the bounds of the campaign range. This is good for you, because that way YOUR risk as a manager is limited. That way you know once the promotion date has ended (eg: the coupon “has expired”), there is no possible way for a new customer to come along and try to claim and unclaimed prize. The customer will simply get a brief message letting them know that the promotion is not currently running, and your contact information will be presented to them so they can contact you directly for more questions. Can a code be claimed twice? We have checks in place upon submission to ensure that once a code has been claimed, it is immediately marked as claimed in our database. So even if a customer tried to claim the same code immediately after, it would send back an error message to the customer letting them know it has already been claimed. This error message can also be customized in case of customer inconvenience, and you can list your contact information there if you would like. Our Offline to Online program was created with a mobile-first design, which means it was created with the intent of being used on mobile by the majority of the end users. It also scales beautifully onto Tablets, as well as Desktop. So no matter where your customers are coming from, they’re going to have an optimized experience. How many input fields does this program support? Our program can handle many fields, however our Base Package only includes up to 5 fields. If you would like more than 5 fields, you may discuss that with our team member upon setup. How long will the website be live? Will the page ever expire? The web page will never expire and will always be up. The CAMPAIGN dates however, is what determines whether or not a customer can claim a code. The Start Date and End Date on a campaign are determined by you, and is the only time a customer can claim a code. If a customer attempted to claim a code outside the campaign range, they will receive a message indicating it is not currently running. We leave the website up forever in case you ever wanted to restart the program after some time, that way your URL remains the same. Who creates the artwork/graphics? Can I or my team create it? Either or, it’s up to you. We have a graphics team on staff ready to work with your brand and design. We also allow artwork to be submitted by you and your team, if you’d prefer that. There is no extra charge for having it done with us. Can I send the customer to my website after submission? The Thank You page allows for a Call-to-Action (CTA, or sometimes called Hotspot or Hyperlink). This can link to anywhere, including you own webpage. Can I create a Vanity or Custom URL? For example, if you wanted to send your customers to winbig.com instead of prizehub.net/winbig, you can do that. It is an extra $100 charge for us to link this up, but it is possible. Am I allowed to add more pins/codes if I want to extend the program? You can add as many codes as you want after the initial generation. It’s a charge of $75 per 10,000 codes added. But you CANNOT add more prizes after the codes have gone out. 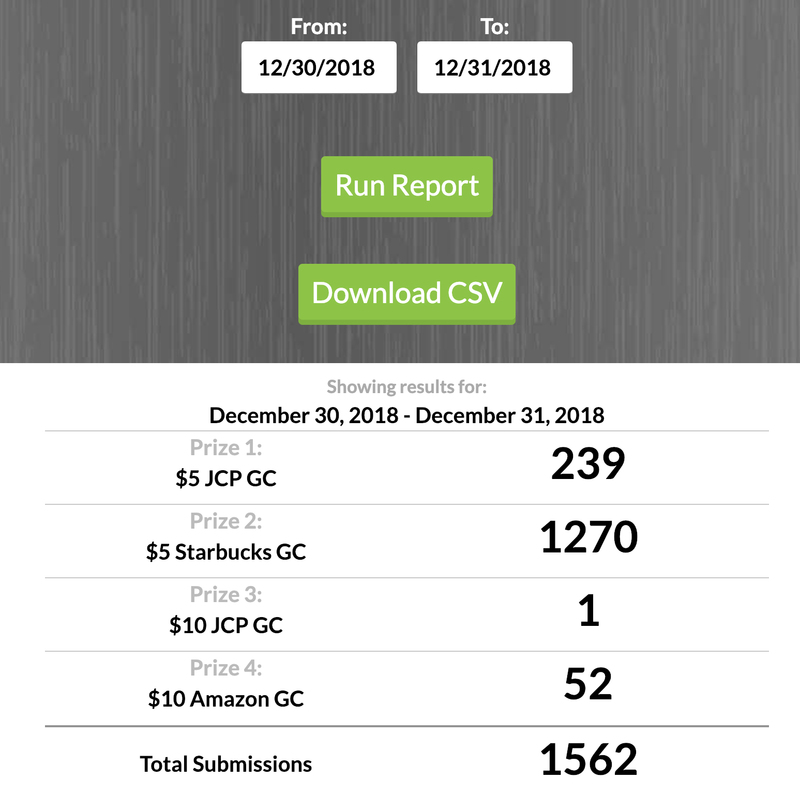 You can only add more codes to the prizes that already exist. Do I need to buy physical cards along with this program in order to use it? Nope. You can purchase this program by itself. However, instead of getting a batch of physical cards with the codes printed on them, you will just receive them as a separate file. 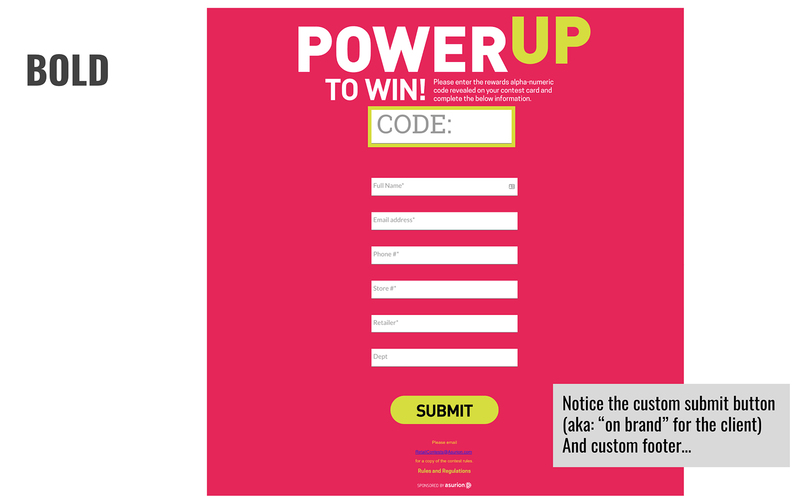 It would be up to you on how you disperse the codes to your customer. Some examples you might utilize this method may include: Online giveaway, customer loyalty reward, new customer signup bonus, Facebook or Twitter campaign, etc. How long do I have reporting access to download the customer submissions? Until 30 days AFTER the campaign end date. For example, if you create the campaign in mid December, with a Start Date of January 1st, and an End Date of February 28th, you will have reporting access from mid December, all the way through March 30th. Don’t worry though! If you don’t get all the customer data, we keep everything securely on our cloud server. Which means if a significant period of time has passed, we can still get your customer data and send it to you. Is my customers' information secure? How do you store the data? Can others see the data? No one will be able to see your customers’ information besides you (and anyone you authorize to view it). You CAN have multiple users with reporting access, but the entirety of our data is securely stored on a server that is locked away and encrypted. It can be accessed by you, and only you. Which means you don’t have to worry about a data breach, hack, or leak and having thousands (or more) of your customers’ personal information being exposed. So what are you waiting for? Enter your information below to start building your campaign today. You will receive a fast response from one of our in-house experts to help create your next Offline to Online marketing campaign. Approximately how many codes (or cards) do you want to hand out? The first 10,000 codes are included with the base package. An additional +$75 will be charged per 10,000 codes after that. Tell us more about your project... any due dates? NOTE: The price listed here is ONLY for the Offline to Online Data Mining program. It does NOT include the price to print and ship physical cards. Any Unanswered Questions? Want to talk to a team member? Or by opening a chat session by clicking the chat icon in the bottom corner.